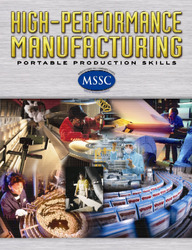 High-Performance Manufacturing: Portable Production Skills is written to MSSC National Standards. Prepares students and incumbent workforce to advance in any manufacturing subindustry by meeting MSSC (Manufacturing Skill Standards Council) Production Skills Standards. Academic & Employability features in every chapter on Information Technology, Communication, Teamwork, Leadership, Problem Solving, and Math & Science help students and incumbent workers build problem-solving and customer service skills, use creative and analytical thinking, better adapt to change, communicate and use technology more effectively. Each chapter ends with a full page of MSSC Certification Test Prep practice items. MSSC Certification cuts across all 14 Manufacturing subindustries.